This series really, really does not like the heat so wait to plant it until the weather has cooled down, maybe sometime in early to mid-October. Ultima was once a much broader series but most have been assimilated along with the old Crystal Bowls into the Supreme series. The Ultima Radiance is most desirable because of the unique bloom pattern with color stain on the margins, Ultima Radiance Red (pictured right) is a personal favorite and the most popular among customers at our nursery and garden center. The Dynamite series has a tendency toward legginess if grown in warm conditions. However, it offers three very unique colors that are are worth the trouble and have performed well in garden beds and containers for me; Dynamite Wine Flash is a maroon/purple iridescent flower with golden/orange highlights, Dynamite Strawberry is a creamy white with distinctive strawberry-colored blotch, and Dynamite Blueberry Thrill (pictured right) is a lemony yellow with blue staining on the petal margins. Wine Flash and Blueberry have been removed from the Dynamite series to be sold “solo." I've heard the Dynamite series is being discontinued and the best of the series will be added to other existing collections. In 2012 I tried the Cool Wave trailing pansies in both containers and beds, but was not impressed. In 2012 a grower-friend of mine produced her first crop of Freefall trailing pansies. She has been impressed with the Freefalls as we hall had been with the discontinued Plentifalls, which were a discontnued series that came onto the scene before the Cool Wave series. 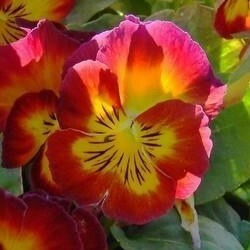 She is also trying some Wonderfall pansies in 2013, which offer a red and yellow in their range of colors, but we'll have to wait to see how these perform. 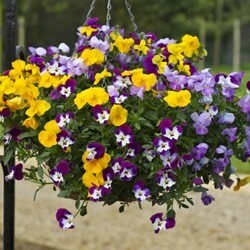 All in all, I think the trailing pansies are best suited for use in pots, window boxes and hanging baskets and would suggest mixing in a few other types of standard pansies and/or ther cool season plants such as flowering cabbage and kale. 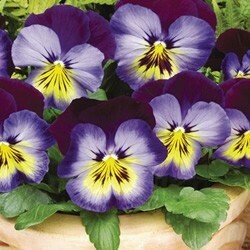 Midnight Glow is a very interesting "solo" pansy that is almost the purple and yellow equivalent to Blueberry Thrill. It performs quite nicely with an early development similar to Matrix. 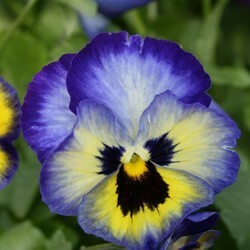 It has rich deep purple petals that contrast nicely with the mid-blue halo around a gold face with whiskers. This one has performed exceptionally well for me in containers. This article was written September 2013. If at any time in the future a new series of pansy comes on the market that demonstrates superior performance in southern gardens I'll provide updates on this page.